"Conch Casa Grande" might well be the largest home available for vacation rental in the Truman Annex, which is appealing to anyone who wants to have some elbow room during their stay in American Paradise. But what really sets this home apart is its wonderful sense of grace and style. From the moment you set foot in the spacious front foyer of this magnificent home, you have a sense of what it might have been like to be wealthy in Key West during the 19th century. With its 11 foot ceilings, mahogany floors and carefully detailed woodwork, "Conch Casa Grande" captures the essence of conch style from another era, but since it was built only a few years ago has all of the modern conveniences we expect from a truly grand home. The living room of "Conch Casa Grande" is simply spectacular; with space and light everywhere you look. There is a large flat screen TV in the living room. The media room and study is as large as most living rooms in Key West. There is an extensive library, a large TV and an over-sized desk for anyone stuck with doing real work during their stay in paradise. With that in mind, this room can be closed for quiet privacy. This is a home that is perfect for entertaining, yet has a relaxed style that encourages you to just sit back and enjoy your stay in the American Paradise. The kitchen will meet the demands of the most ambitious chef and it is large enough for the sous-chef and assistants, too. In fact, the whole family could hang out here, with plenty of seating at the kitchen bar. The powder room is nearby, and you will be surprised to see that it is as large as many master baths; it has a full bathtub and shower as well. From the living room and kitchen you can see the private pool through the SIX sets of double french doors that span the entire back of the house. There will be plenty of room on the porch and patio for everyone in your group to get their fair share of sun or shade, with the complete privacy afforded by the lush landscaping. >> First Master Suite: Located on the First Floor with a King bed, a flat screen TV, a closet, direct access to the front porch, and an en-suite bathroom with a shower and tub combination. >> Second Master Suite: Located on the Second Floor with a King bed, a flat screen TV, a large walk-in closet, direct access to the back balcony, and a spacious en-suite bathroom with double sinks, a walk-in shower and a shower and tub combination. >> Third Master Suite: Located on the Second Floor with a King bed, a flat screen TV, a closet, direct access to the back balcony, and an en-suite bathroom with a shower and tub combination. >> Fourth Master Suite: Located on the Second Floor with a King bed, a flat screen TV, a closet, direct access to the front balcony, and an en-suite bathroom with a shower and tub combination. >> Fifth Master Suite: Located on the Second Floor with a King bed, a flat screen TV, a closet, direct access to the front balcony, and an en-suite bathroom with a shower and tub combination. We enjoyed this home (2nd time) and Shel was wonderful- took care of all our needs. The property is great for sharing, there is ample space for people to share together and still have space away from one another. It's close to everything you could want to do in Key West. Shel was wonderful and attended to all of our needs! 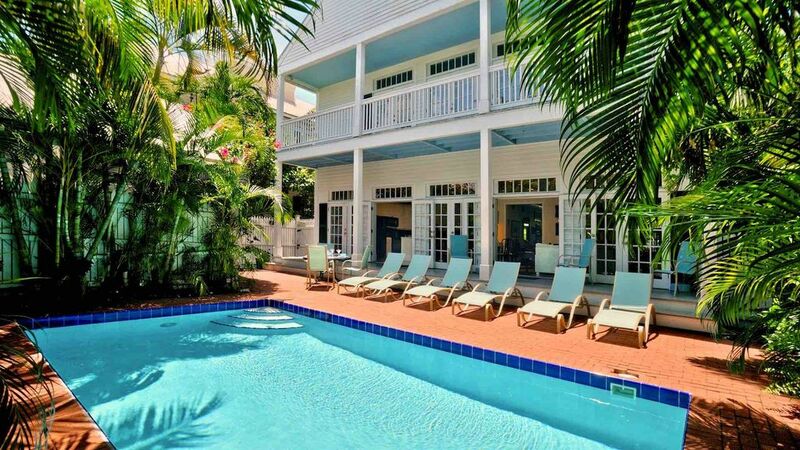 This house was a perfect choice for our family of 8 to experience Key West. Standing in the kitchen the first morning while all still asleep felt like home. Everyone having their own in suite full bathroom made shower/getting ready time a breeze. The pool is a bit small for 6 little ones but that didn’t stop them from swimming every day and the location and safety of the private, gated community can not be beat! This house set a high bar that did not disappoint! There were eight of us, mostly retired and we had a wonderful stay at 58 Front Street. The Truman "Little White House" is across the street with easy access and Mallory Square is just down the block. Fausto's grocery store is three blocks away and you don't really need a car to go to it, but it helps. One of us rented a car and we used it a couple of times, there is a car port. Definitely visit the Little White House and Mallory Square. We also enjoyed the Jet Ski Tour around the island. I found the Dry Tortugas snorkeling trip just so-so. The Hemingway house was great! The sunsets were outstanding. We used the swimming pool at the house a lot. The house is very roomy, well taken care of, and well decorated and Last Key realty were very attentive and took care of anything we had a problem with, which wasn't much. Well worth five stars, we had a great time! The Mahi tacos at Viva Saloon were excellent and the BBQ at Charlie Mac's was good. Don't order the Mahi-Mahi at El Siboney, they don't know how to cook it, mine was thin and dry because they cut the skin off and had no sauce, cardinal sins! But the other dishes we had there were good. The shrimp Po' boys at Caroline's Café were good also. Perfect house for our family. Quiet but close to the action. Will stay again. We love Conch Casa Grande! The house is better than anyone could try to explain online and the service provided by Shel of Last Key Reality was magnificent. Thank you for a great stay and hopefully we can return again for our 45th anniversary. Thanks again!